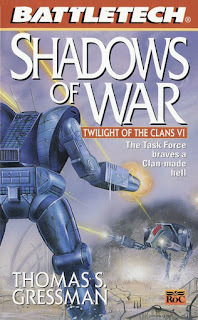 Nipping at the heels of Sword and Fire comes Shadows of War that continues the story of Task Force Serpent in taking the Clan Smoke Jaguar homeworld of Huntress. The last book covered the final leg of the journey and their initial assault on the planet. This next book covers how hard it is to occupy a world, especially one belonging to the Smoke Jaguars. This book is pretty brutal and continues singing from the song sheet that reinforces that war is terrible and is not a thing to be celebrated. And this book really goes out of its way to send this message along in almost every chapter as things seem to get worse and worse for everyone quite frankly - no one is spared. So in some ways the book certainly fulfilled its goals in that regard, even if it felt a little heavy-handed in its approach. And it's not like the last book was all that triumphant in tone nor did it leave me with a lighter feeling of victory at the end. And that darker tone seems to permeate through this follow-up novel. 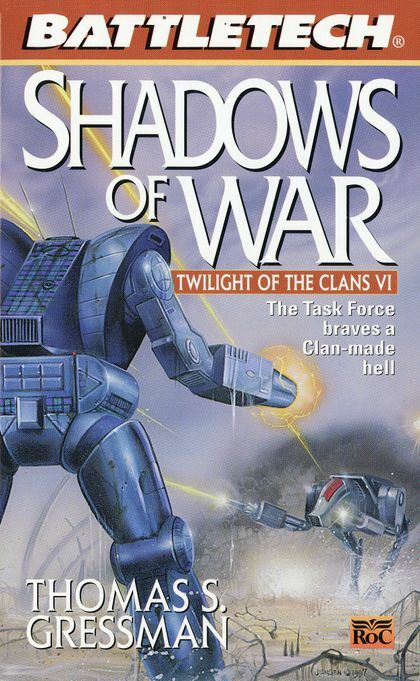 Synopsis: Battletech: Shadows of War is the sixth book in the Twilight of the Clans series as written by Thomas S. Gressman. The book pretty much immediately follows the events of Sword and Fire. The initial assault on Huntress was largely successful given the members of Task Force Serpent were able to take all of their planned objectives. But what they were unable to do was to eliminate all Smoke Jaguar military assets on the plan, thus opening the door to a counter assault or even guerilla warfare, should the Jaguars actually go against clan tradition in that regard. What we get though is a series of surprises not just by the forces on the ground but by the Clan Smoke Jaguar leadership on Strana Mechty. How it all comes together is a masterful reminder of Clan superiority in terms of technology and how it often takes more Inner Sphere forces to take down their Clan equivalents. What I Liked: We spend a lot of time following around General Ariana Winston, head of Task Force Serpent and her thoughts throughout the campaign as they do their best to achieve their objectives. The Eridani Light Horse mercenaries are often cited in different Battletech books but we don't always get a lot of discussion of the people that drive it. And thus these books have done really well to highlight more about her and hows he deals with things. And I was rather surprised at the Clan counter attack and how the last big push really barreled through things. Despite their world practically falling apart all around them the Smoke Jaguars never give up and continue to push and push and push with no really doubts of their victory. The Inner Sphere forces certainly show a lot of resilience in how do their best to stand their ground but the Clans are prided to be the pinnacle of human genetics for a reason. What Could Have Been Better: That said, the book can feel a little one note as it's just skirmish after skirmish with Task Force Serpent now largely playing the role of defender in a quirky turn of events. And it just results in a slow winnowing down of their forces as the Smoke Jaguars continue to take advantage of their knowledge of the planet and the occasional OmniMech that still counts for several Inner Sphere equivalents. But it's the ending that really got to me as being a little trite and very deus ex machina as things are resolved not by the forces on the ground but by a timely intervention born of narrative quirkiness. And thus the many deaths and other losses feel hollow or even just cheaper because of that decision. Not even the assassins secreted in the fleet get a better use of their skills despite so much build-up in prior books. TL;DR: Battletech: Shadows of War is a hard book to real covering a brutal, agonizing period of Battletech lore. It may make more sense in the greater scheme of things but on its own it's not a great read if only for the way it plays with its characters so haphazardly. Thus the book only gets 3 Clan surprise attacks out of a possible 5.